Instruments by members of the Pollastri family span nearly a century, including some of the greatest examples in modern Italian lutherie. Their revolutionary style, while veering away from earlier fine violin making in Bologna, has inspired many followers. Augusto Pollastri was born in Bologna in May 1877, the son of Cesare, an agricultural worker, and Clelia Grandi, a weaver. His childhood could not have been easy. He was one of eight children, but only two of his siblings, Gaetano and Linda, survived childhood, and the family was poor. He first encountered violin making aged only eight, performing menial tasks for Raffaele Fiorini. 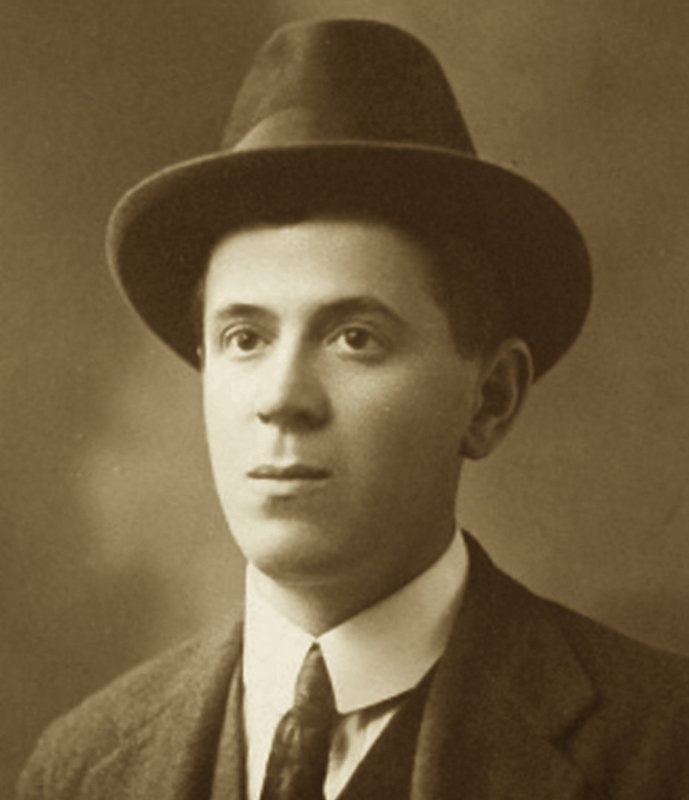 Having lost his father in 1894, the then 17-year-old Augusto progressed to becoming Fiorini’s garzone or apprentice – a job that helped support his family, which included his six-year-old brother Gaetano. Augusto may well have come to view Fiorini, who was nearly 50 years his senior, not only as his teacher but also as a father figure. By 1894 the Fiorini workshop in the historic Palazzo Pepoli was coming to the end of its existence. Raffaele’s own son, Giuseppe, and the Candi brothers, who had worked for him during the mid-1880s, had long since left Bologna, leaving only 19-year-old Armando Monterumici, who, like Pollastri, had worked there from a very young age. Carlo Carletti, whose early work shows an affinity to that of the Fiorini workshop, may also have worked there during the 1890s; similiarly Ettore Soffritti of Ferarra, who was born a month after Pollastri, is presumed to have passed through the workshop, although there is no documentary proof of any such association with either of them. These young makers were all poised to put their own ideas to work and began their respective careers at the start of the 20th century. Demand for their talent had become plentiful, but with it the competition also strengthened. According to Augusto’s nephew, Cesare (who was about two years old when Augusto died), when Raffaele’s health began to fail in the mid-1890s, Augusto took over the running of the workshop; however, it is equally likely that it was the older Monterumici. It was he, and not Augusto, who at Raffaele’s death in 1898 briefly took over the workshop, and he was also the recipient of Raffaele’s workshop tools. Monterumici soon moved to a workshop nearby, where he, unlike Augusto, continued following his master’s style. In the meantime, Augusto set up his own workshop in a room at his home in via Castiglione 91, just outside the old city walls – about a ten-minute walk away. Augusto always hoped to return to the highly coveted, central location of the Palazzo Pepoli, but apparently he was never able to afford the high rents. Pollastri thus remained in via Castiglione for the rest of his bright, but sadly non-prolific violin making career. During the early part of the 20th century, Pollastri and Monterumici were the only makers of any merit working in Bologna itself (Carlo Carletti had settled some 30 km north of the city, in Pieve di Cento). However, as we shall later see, Pollastri’s violin making began to follow a vastly different direction from that of both Fiorini and Monterumici. In the first years of the 20th century Augusto also began training his brother Gaetano, who by 1910 was substantially involved in the workshop. 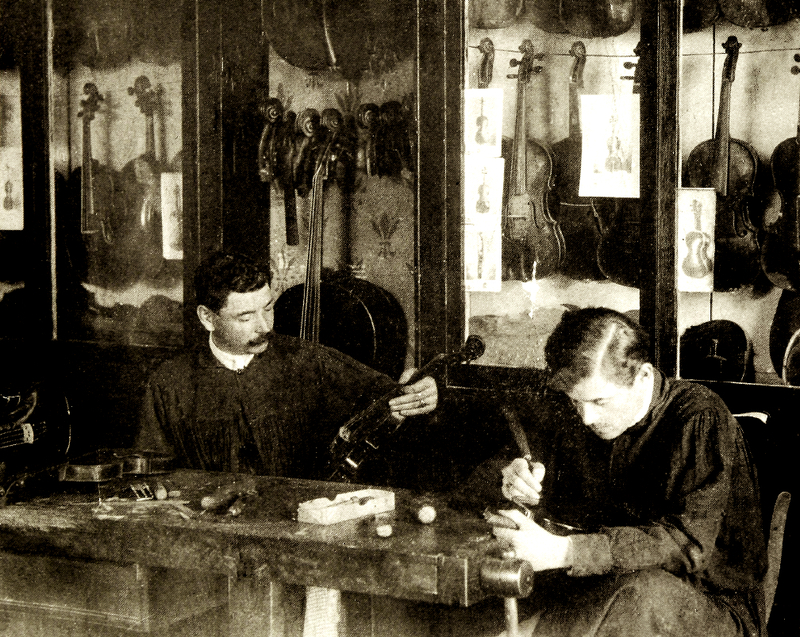 The brothers’ strong partnership helped the shop to become a focal point in Bologna’s violin making and restoration. By around 1920 Augusto had developed the Pollastri brand, symbolizing the personal and professional bond between the siblings. Derived from the word pollastro (cockerel), it features two cockerels facing each other, with beaks touching. The workshop’s uncommonly fine work attracted the praise of musicians, including Pablo Sarasate, and soon Augusto came to be considered as one of the era’s leading makers and restorers. In around 1922 Marco Dobretsovich, a native of Montenegro who had been living in Cairo, contacted Augusto for advice and by around 1924 Pollastri had taken him in as an unofficial apprentice. Following a brief stay in Bologna, this talented maker returned to Egypt, where he continued a highly successful and prolific career. His best work is comparable to the better instruments by Gaetano, with whom he was still in communication in 1928. In 1924 Augusto was awarded a Star of Merit for his work, and in 1927 he won a Cross of Merit at the Fiume Exhibition. In the latter year he also won first prize in the Geneva International Music Exhibition. However, on November 9 that same year his blossoming career was abruptly cut short by an acute, incurable illness quickly followed by his premature death at age 50. 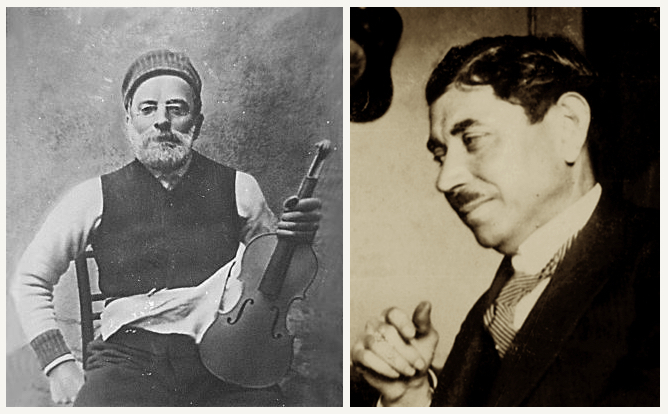 Apart from having been the most influential violin maker of the modern Bolognese era, Pollastri was also remembered for his modest and polite manner. Coincidentally, Augusto’s exact contemporary, Ettore Soffritti of Ferrara, died scarcely two months later, leaving a sudden void in Emilia’s fine violin making tradition. Its future now rested upon the shoulders of Gaetano Pollastri and Ansaldo Poggi. As we have seen, Gaetano was a young child when the Pollastris lost their father and so Augusto, 11 years his senior, must have helped to raise and eventually train his brother. Gaetano studied the violin and in his youth worked as a professional violinist. Nevertheless, he spent much of his time in his brother’s workshop learning restoration and violin making, and by his mid-20s his role in the workshop began to replace violin playing as his main occupation. By 1913 Gaetano had abandoned performing altogether, further intensifying his collaboration with Augusto. After the death of his beloved brother, the 40-year-old Gaetano inherited the workshop’s faithful clientele and, sharing Augusto’s skill and good taste, he continued in his brother’s footsteps. He opened his own workshop in via G. Petroni (moving two years later to Piazza S. Martino) selling his own instruments and dealing in old ones, and quickly established a fine reputation for his violin making and restoration, as well as his knowledge of old Italian instruments and the marketplace. An extensive correspondence with his clients from the 1940s to the 1960s illustrates his dedication to his field, offering his convincing opinions and insight. With many other excellent makers working in nearby Emilian towns, the region had arguably turned into the most productive in Italy. Shortly before Augusto Pollastri’s death, the blossoming career of the key descendant of the Giuseppe Fiorini school, Ansaldo Poggi, confirmed Bologna as a major center for fine new lutherie. The younger and energetic Poggi began to compete with Gaetano for supremacy and eventually his exquisite and plentiful work, with its innovative designs and excellent tone projection, left Gaetano in a secondary position in the city’s violin making hierarchy by the 1940s. Despite the rise of this young adversary from the 1930s to the 1950s, Gaetano had managed to secure a favored position in Bologna. In 1930 he donated to Pope Pious XI a violin with the papal coat of arms. He was also a founding associate of the ANLAI (National Association of Artistic Italian Violin Making). Gaetano won various prizes for his instruments, including certificates of honor in Cremona’s 1927 and 1949 competitions. He died aged just short of 74 in 1960. Gaetano taught a number of pupils, including his own son, Cesare, who was born in 1925 and trained as a doctor. His interest in violin making nevertheless led to his assisting Gaetano during the 1940s. During the early 1950s Otello Bignami also joined the workshop. Bignami became Gaetano’s finest pupil and in 1979 founded his own Bolognese violin making school, where he passed on the Pollastri style to several pupils, who to this day infuse the contemporary Bolognese school with the Pollastri tradition. After Gaetano’s death, Cesare continued working in his father’s workshop in his spare time, while exercising his primary vocation as an ophthalmologist. 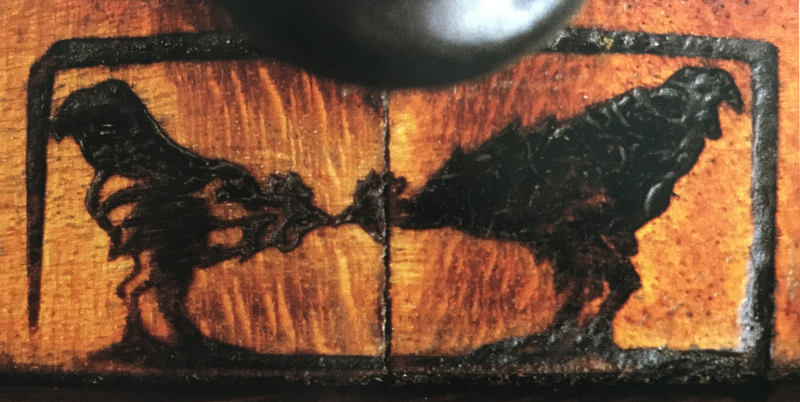 Although Cesare died in 1998, completing the nearly hundred-year cycle of the Pollastri violin making legacy, another pupil of his father, Franco Albanelli, carried on producing Pollastri school instruments until his own death in 2007. In part 2 Dmitry Gindin explores the Pollastri brothers’ work from a stylistic perspective.